One way the constraints on the Faculty of Arts and Sciences (FAS) show up is in the relatively restrained growth of the faculty itself. From the fall of 1996 to the fall of 2006, the number of professors rose 17 percent, from 598 to 701. In the decade since, the cohort grew just 4 percent, to 732 (with engineering and applied sciences, and life and physical sciences, accounting for 14 and 30 net new positions, respectively, and the arts and humanities and social science divisions 12 and 1 positions smaller, respectively). FAS plans to maintain this level cohort, even as its composition continues to shift toward sciences—particularly the applied varieties. Bringing aboard new scientists entails FAS outlays to fit up expensive laboratories and fund new colleagues’ research until they qualify for competitive, external sources. The financial section of FAS dean Michael D. Smith’s annual report refers to numerous capital investments and fellowship commitments to advance work across the sciences. Another change accompanies this strategic remaking of the faculty. The “faculty trends” section of the report notes that of 103 FAS faculty members who have signed agreements since a formal retirement-planning program began in 2010, 90 (more than 87 percent) have been men, and 13 (just under 13 percent) women. 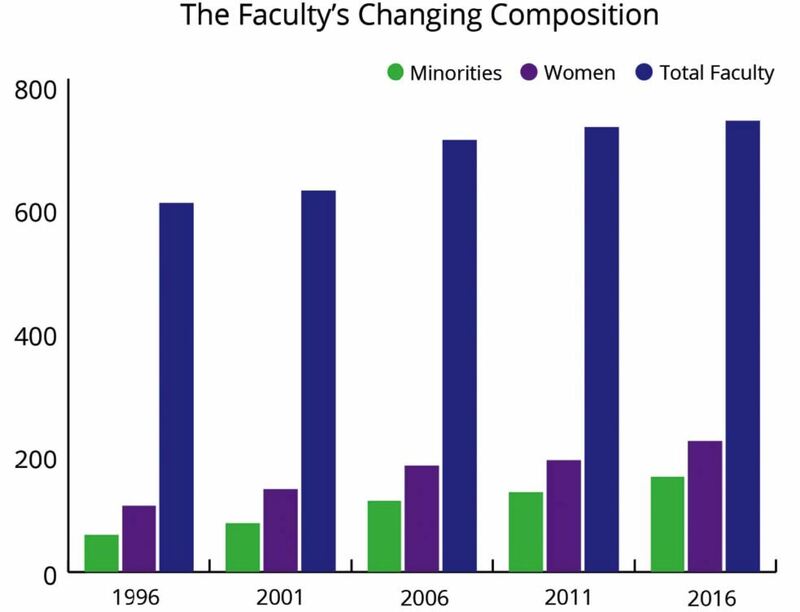 As they retire, notes the report, and FAS continues “to recruit and promote from more inclusive candidate pools, we expect to see greater diversity in the senior faculty.” Along that dimension, at least, FAS can expect to progress toward one of its important goals even when the faculty as a whole is not growing. In the near term, of course, retirement of a senior faculty member and his or her succession by a junior one may have the effect of reducing compensation costs for a time. But as the flow of junior appointees ascends toward the tenured ranks (more than three-quarters of FAS professors are tenured), that buffer would diminish. Read an updated report on the faculty  from the February 7 FAS meeting, held after this story went to press.